Two Bedroom Apartment. Free WIFI & satellite TV. AirCon. Close to golden sandy beaches. 2 bedroom, 2 bathroom apartment located in the Atalaya complex close to the beach with stunning sea views, air conditioning, wifi & satellite TV. We accept payments in Euros or in Pounds. This excellent value, bright and airy two bedroom ground floor apartment with one en-suite and one family bathroom and a fully equipped kitchen has free Wifi, Satellite TV with UK channels, a book cupboard and a wonderful panoramic view of the ocean. Located in the popular and peaceful Atalaya complex in Puerto del Carmen it has full sun all day yet a shady terrace on which to sit and relax and enjoy the views and your holiday. Situated in a quiet location it is close to sandy beaches and the Promenade where a huge variety of bars , restaurants and entertainment can be found to suit all tastes ranging from tranquil sea view restaurants to tapas bars with spanish music to bars with live singers and live bands. The apartment is only 10 minutes from the airport and will appeal to couples or families looking for a comfortable base from which to enjoy the island of Lanzarote. The complex is gated and can only be accessed with a key, so is therefore very secure. 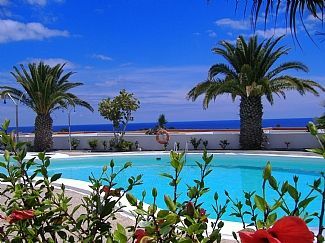 Within the complex there is a large swimming pool and a separate children´s pool. Although the apartment is located on the top level of the Atalaya complex which has steps at the front entrance , the best access is via the back gate, where there is flat access to arrive by taxi without any steps and is much more suitable for suitcases, push chairs and shopping. There are two excellent supermarkets very close by and the island enjoys an excellent but inexpensive car hire, bus and taxi service to explore the Spanish towns and culture of Lanzarote and its many tourist attractions for both adults and children. toilet, shower, Mirror, shaving point, towel rail. Good supply of hot water. Ensuite to master bedroom is equipped with	Shower enclosure, basin & mirror. WC. Towel rail. Good supply of hot water. Family Bathroom is equipped with shower enclosure, basin and mirror, shaving point. Towel rail. Good supply of hot water. Operated on a coin meter at One Euro per half hour which is sufficient to warm up the apartment. Works via the air conditioning unit, but raising the temperature rather than lowering it! The kitchen is fully equipped with Ceramic hob, Oven, Washing machine. Fridge freezer, fitted kitchen units, microwave, kettle, toaster, wine rack, tea towels, washing up bowl. Tea/coffee pot etc. The Dining Area is located on the terrace and has a glass topped dining table and four very comfortable dining chairs and cushions. Flat screen TV with satellite TV via the internet. full sun all day yet a shady terrace on which to sit and relax and enjoy the views on your holiday. The Puerto del Carmen golf course is only a 5 minute drive and the more established golf course at Costa Teguise is only a 25 minute drive away. Large swimming pool with deep end and childrens pool. Pool Terrace with sunbeds, parasol stands and Palm trees..
Cot and high chair available on request and for a small fee. Hairdryer provided. Situated in a quiet location it is close to sandy beaches and the Promenade where a huge variety of bars , restaurants and entertainment can be found to suit all tastes. Although the apartment is located on the top level of the Atalaya complex which has steps at the front entrance , the best access is via the back gate, where there is flat access to arrive by taxi without any steps and is much more suitable for suitcases, push chairs and shopping. Nice quiet position. Only drawback are the steps leading down to Calle Pedro Barba. Ok, there is a back entrance which is on same level as apartment but if you want to go to Spar supermarket then the dreaded steps are only option. Thank you for your review Chris. Good to hear that you liked the quiet location of the apartment. To avoid the steps to go to the Spar supermarket, there is another supermarket (Hiperdino) at the end of the road from where the back gate is. Although it takes a few minutes longer to walk there, it is a completely flat walk and it does avoid having to walk up/down the steps. Thanks for your review and great to hear that you enjoyed your stay! Great week in the sun! Clean & comfortable apartment. Good facilities as described. Great location. Complex nice & quiet. Would definitely stay here again. Central location near the casino pool great not overcrowded shops nearby. Apartment has wi fi and sky and the porch is a nice little sun trap with tables and chairs. Clean and everything you need inside only thing I would add is some portable fans as you have to pay for air con. Thanks for taking the time to write your review and great to hear that you would return to the apartment. Clean apartment with all you need. Easy check in and communication. Would definitely stay again. Thanks for taking the time to write a review. Great to hear that you found the check-in easy and that the apartment was equipped with everything you needed! We look forward to seeing you again! Thanks for taking the time to write your review and providing us with feedback about the facilities in the apartment. Close to sandy beaches and the Promenade where a huge variety of bars , restaurants and entertainment can be found to suit all tastes. The apartment is only 10 minutes from the airport and will appeal to couples or families looking for a comfortable base from which to enjoy the island of Lanzarote.